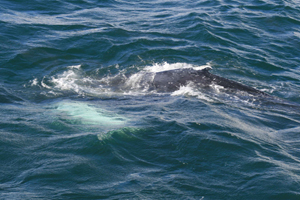 30th Oct 2007 A young humpback whale Megaptera novaeangliae was observed on 28th Sept. 2007 off Co. Cork, Ireland. The same humpback whale was observed off the Netherlands in early May 2007 making this the first time the movement of a humpback whale has been tracked within European waters. We are delighted; we started working on humpback whales in Irish waters in 1999 and this is by far our greatest breakthrough to date. On 28th Sept. 2007 the humpback whale was observed and photographed by Conor Ryan, IWDG off Toe Head, County Cork, Southwest Ireland, during a whale-watching trip with Colin Barnes of West Cork Marine Tours. The whale was estimated at between 5 and 6m in length, making this a very young whale. During the encounter a series of digital images were obtained so that the individual could be recognized by distinctive markings. The IWDG maintains a catalogue of individually recognizable humpback and fin whales observed in all Irish waters, and images of this humpback whale were placed on the IWDG website www.iwdg.ie. 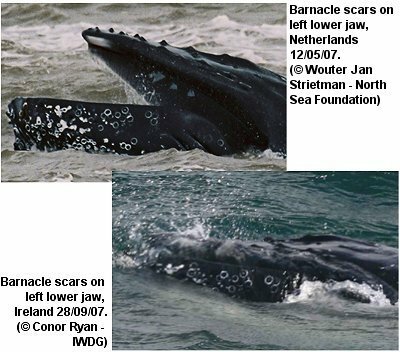 On 22 October the IWDG received an e-mail from Wouter Jan Strietman of the North Sea Foundation in the Netherlands, informing us that he had seen the images of the humpback whale on the IWDG website and were confident that it was the same individual observed between in the Wadden Sea area between Den Helder and Texel Island, Netherlands from 10th-13th May 2007. A number of images of the humpback's head, back, dorsal fin and tailstock were compared, which confirmed without doubt that it was indeed the same whale. Images were also forwarded to Allied Whale, the marine mammal lab of the College of the Atlantic in the USA, who curate the North Atlantic Humpback Whale Catalogue (NAHWC). They and colleagues confirmed the match and also informed us that this whale has not been recorded anywhere else in the North Atlantic. Can you make the match by comparing the barnacle scars on the lower left jaws? Over the 138 days between the two sightings the whale traveled a minimum distance of 1,158 km, if it moved south through the English channel along the Irish south coast. Interestingly, although the distance involved is considerable, both locations are within 160 km of the same latitude. Humpback whales have been extensively studied in the North Atlantic but this is the first time the migration of a humpback whale has been tracked within European waters.